Have Questions or Prefer to order via phone? Drop us a line at 888-486-9463 or 1-601-932-5111 (Internationally). It's always a great time to save on the world's most comfortable recliners. Unwind consistently brings you the lowest prices allowed on all Stressless Recliners. Choose your favorite leather grade, pick one of the fabulous colors, and match it perfectly with an amazing accessory, for the ultimate in comfort. With the changing season comes new ways to save! Choose from many, many Stressless Furniture items in our Ekornes Authorized Price Reduction Inventory (EAPR) and save $100's from what you'd expect to pay. We also make it super easy by including the Ekornes mandated delivery fees in the EAPR model pricing. So the price you get on our Ekornes Authorized Price Reduction models is the "delivered" price with no additional fees- Did we mention the Sales Tax Benefits?? Considering an accessory for your Mayfair small? Choose one of the following: the simple Swing Table, the ultra-convenient Personal/Laptop Table, the useful Ellipse Table, the stylish Urban Table, or the fan-favorite Elevator Ring set. Enjoy Fast, Worry-free Delivery on a Large Stressless Mayfair Recliner with Ottoman. Start relaxing in your beautiful new Large Mayfair (Kensington) Recliner sooner with our Quick and Easy Shipping Methods. It's a great time of year to purchase from the amazingly comfortable, Stressless Mayfair line! This popular, modern recliner delivers exquisite head, neck and back support and the over-stuffed smooth, soft, cushioning allows you to sit undeterred for many hours on end. 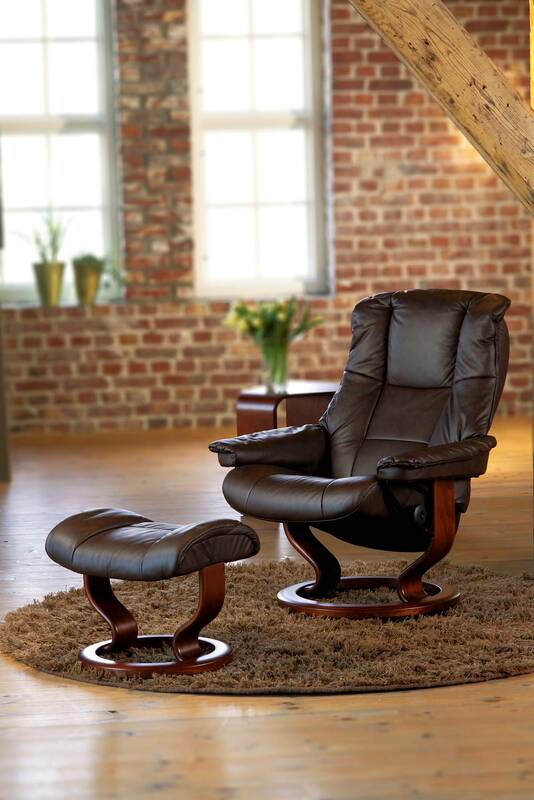 The Stressless Mayfair Large recliner is among the most modern Stressless recliners available. Looking to add a matching Stressless Sofa, Love-seat or Sectional? You’re in luck as the Ekornes Paloma Specials Sale Colors are also eligible for additional savings under this promotion. These deals can save you $1000’s. Simply choose your matching Paloma leather sofa or sectional model and watch the savings stack up! We also deliver fully-assembled, brand-new items right through the front door of your business or home with the Fastest Shipping Methods available. We have 100's of recliners in stock for fast delivery to virtually anywhere in North America. There's no need to pay for standard shipping when you can have Priority Shipping at no cost. All of our items are backed by the rock-solid 10 year Manufacturer's Warranty at no additional cost. You can truly relax and unwind when you choose the world's most advanced recliners. From the patented technologies, to the outstanding construction and engineering, down to the incredibly useful accessories, you will be able to relieve stress and tension and promote a genuine sense of well-being in this seating solution. It is certainly a great time of year to purchase from the bestselling, most-comfortable Stressless Chelsea (or Mayfair small), Mayfair medium (and Mayfair Office), Mayfair Large lineup! This popular series delivers unsurpassed head, neck and back support and the smooth, soft, cushioning allows you to sit undeterred for many hours on end. This line is always among the bestselling Stressless recliners at Unwind. The Kensington's deep seat allows your body to sink into the foam and truly escape the stress of the world. You will instantly feel the lumbar support reach out and greet your lower back. As you recline, the support will continue to be there for you, ever so gently. The layers of foam padding will ensure this chair is comfortable for its 25 year lifespan and beyond. The velvety smooth Chocolate Paloma Leather is quite popular. Pair it with the Walnut Stained Wood and you have a timeless classic that is backed by a solid 10 Year Manufacturer's Warranty. Want to add a matching Stressless Sofa, Love-seat or Sectional? You’re in luck as there are Ekornes Paloma Specials that will save you $1000’s. Simply choose a matching Paloma leather sofa or sectional model and watch the savings stack up! *Would you prefer to receive your Mayfair large recliner faster? Choose one of our other speedy delivery methods. This series is typically one of the most popular, best-selling models in the entire Ekornes Family. It only takes a few seconds sitting in one to understand the reasons. Let's talk comfort. Not style, just comfort. As your first sit down you notice the seat is wider than it appears. The overly-stuffed armrests lend to "cushioning" you perfectly in a net of soft foam and premium leather. The 2 Vertical Seams running from the top of the back cushion all the way through the seat cushion line up perfectly with your major back muscles. These muslces are some of the longest and harding working muscles in your body. The average person tends to notice the first signs of tension and stress in these specific muscles. Allow Ekornes to "have your back" on this one. As you sit longer, you will begin to notice several things. The primary one being the relaxation that is invading your back muscles. The next being how the armrests are deceptively supportive. This is despite their "fluffly" and round appearance. These guys pack quite the concealed firmness. Ekornes knew that compressing that foam to a certain extent during manufacturing would allow your arms to slightly sink into the space-age foam without compromising support. The next will be the slight angle to the direction of the seat cushion. You will notice that the front portion of the cushion is higher. It meets the back of your knees in a way that allows those major arteries to flow unrestricted. Any discomfort due to poor circulation might just begin to subside. The gradual decline towards the rear of the seat cushion only promotes that "natural" and "organic" posture that your body prefers. You will notice that a lowered back of the seat cushion allows the weight of your hips to be displaced in a way that relieves the weight of support. There is nothing like one of these recliners. It's no wonder they are Chiropractic approved and so incredibly popular. Like its smaller siblings (the Stressless Mayfair medium and small recliners), the Stressless Mayfair large recliner has been called "perfectly comfortable in all the right places." In other words- "Just the right amount of support and comfort to the parts of the body that desperately seek a refuge from the toils of everyday life." Want to view informative Ekornes Stressless videos to assist you in selecting the perfect Stressless Recliner? Simply click the following link, select the search button (the magnifying glass on our YouTube page) and type the name of the Ekornes chair or Stressless furniture item that you would like to preview. You can also search by leather type & color to get a closeup view of most popular leather options. Search and watch 100's of Stressless recliner videos at The Unwind Company YouTube site here. Come visit the Unwind Back & Body Store to experience the Ekornes Stressless Mayfair large/Kensington Recliner for yourself. If you have already decided and are ready to purchase, simply click the "Add To Cart" button (below) after selecting the available options. Please review our return policy prior to ordering or call 888-486-9463 or 1-601-932-5111 for personal assistance. You may also email stressless@unwind.com anytime- 24 hours - 7 days a week. We have many Mayfair Large recliners in stock which allows us to ship your recliner extremely fast and have it delivered quickly from coast to coast. Please call 1-888-486-9463 and you can be enjoying your Stressless recliner much faster than you ever imagined. - The easily-moved ottoman also features a built-in tilt system that adjusts to your body movements for the ultimate in comfort. - Stressless Recliners and Accessories are built to last for many, many years. Many of our customers are loyal, repeat Ekornes customers that have enjoyed their original Stressless recliner for 25-30 years or more. -Stressless Recliners are created for a custom fit- Many of the Stressless recliners come in three sizes (small, medium or large) and many sofas are available in two sizes (medium or large). 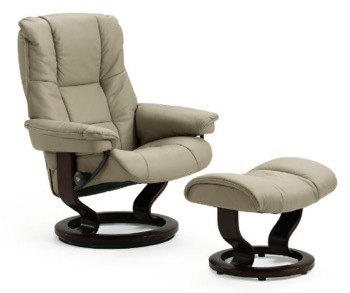 The Stressless Kensington Recliner (large) is comparable to the large versions of the other Stressless recliner lines (Stressless Vegas, Stressless Spirit etc). The Stressless Chelsea,Stressless Mayfair and Stressless Kensington Recliners (small, medium and large) share the same attributes. For best results, take a seat and let us help you determine which size will ultimately offer the most comfort and correct support for your individual body size and weight. It's no wonder that Stressless Mayfair large Recliners are Exclusively Endorsed by the American Chiropractic Association (the ACA). Have questions or need additional information about the Stressless Kensington or other Stressless Recliners from Ekornes? Please contact us at stressless@unwind.com or at 1-888-4-UNWIND (888-486-9463). We're here to assist you with your Stressless Recliner or other Soothing Back Product or Furniture purchase. The leather is so soft and the chair reclines so far back, its an amazing for my back. I just received my Kensington recliner in Chili Red. It is beautful, and the leather is buttery soft. The chair is supportive and I swear sitting in it regularly for a few days has realigned my spine. The folks at Unwind.com are/were amazing. So nice, so helpful. Andy was a godsend as I had a million questions and issues. The only reason I didn't give 5 starts is because the chair is so new. I've learned not to give a review on first impressions. So many reviews online are based on that. You need to own something for a bit before you can truly give a review. Like this model a lot. Really preferred a fabric choice, but chose not to wait. Why not stock more fabrics? Tried many recliners and this one seems to hit the mark. I'm headed back to the store and planning to put this one in our living area. Tried almost all the models and kept coming back to the kensington model. The mayfair/kensington chairs that my wife and I purchased from unwind are perfect. Received in perfect condition in only 3 days. The Kensinton recliner rocks. I'm about 6'2" and the built in headrest and lumbar support fits me well. My wife is a bit shorter and would actually prefer the Stressless Mayfair (when we free up some more $$). Overall a really nice purchase.